LONDON (AFX) - Evolutec Group plc, a biopharmaceutical company developing products for the treatment of allergic, inflammatory and autoimmune diseases, said its hay fever drug candidate rEV131 has demonstrated an additional mechanism that may give it anti-inflammatory properties. It said rEV131, currently in Phase IIb trial, has an equivalent impact to an experimental small molecule H4 receptor blocker which may explain its anti-inflammatory effects, such as the significant reduction in nasal congestion observed, in previous clinical trials in asthma. 'We believe that rEV131 has the potential to fill the unmet need in allergic rhinitis for a new product which has a fast onset and reduces all symptoms,' it said. Evolutec also said it is on schedule to deliver the results of its North American 300-patient Phase IIb hay fever trial by the year-end. A significant number of patients use vitamin and mineral supplements, herbal remedies, and drink coffee and tea for relief of asthma and rhinitis symptoms. These practices could cause additional health problems and may even have life-threatening adverse effects, researchers warned here at CHEST 2006, the 72nd annual meeting of the American College of Chest Physicians. Paul D. Blanc, MD, FCCP, and colleagues at the University of California at San Francisco conducted interviews with 375 patients with asthma and/or rhinitis at baseline and again 2 years later. Dr. Blanc said that 15% of patients had asthma without rhinitis, 70% had asthma with rhinitis, and 56% had rhinitis alone. The investigators prospectively compared physical health status and the use of complementary and alternative medicines for alleviation of symptoms. Continue reading Half of Asthma Patients Use Complementary Therapies. Continue reading Here's food for thought about allergies. RICHMOND, Va., Oct. 30 (UPI) -- A U.S. research team says it has identified an enzyme involved in allergic reactions, possibly providing a new target for the treatment of such maladies. The scientists from Virginia Commonwealth University, the Hospital for Special Surgery and Weill Cornell Medical College in New York note allergic diseases such as asthma and hay fever afflict about 30 percent of people in the developed world -- and allergic reactions are the sixth leading cause of chronic disease in the United States. Continue reading Enzyme involved in allergic diseases found. Continue reading Key molecular signaling switch involved in allergic disease identified. SINGAPORE: Cow's milk allergy is one of the most common childhood allergies but it is often misdiagnosed, say doctors. It is believed that 3.5% of all children who have severe reactions to food are allergic to cow's milk. Angry rashes plagued Charlotte Lum from the time she was just five weeks old. Doctors she went to told her parents it was eczema. The girl continued to suffer till she was three. Continue reading Cow's milk allergy prevalent among children but often misdiagnosed. Asthma is an ancient Greek word that means "panting, gasping or short-drawn breath." It is one of the most discomforting of respiratory ailments, known to affect around 5% of the world’s adult population and 10% of children. Tests carried out at Yoga Therapy Centers across the world have shown remarkable results in managing asthma. In some cases it has also been found that asthma attacks can actually be averted, without the aid of drugs, just through yoga practices. Since Yoga believes that the mind is central to a diseased condition, pacifying and placating it would, in itself, help cure asthma to a great extent. The practice of yogasanas, yogic kriyas, pranayamas, relaxation and meditation calm down the whole system. This, in turn, facilitates proper assimilation of food and strengthens the lungs, digestive and circulatory system. Over a period of time, that checks asthma attacks and even cures the asthma condition. Continue reading Yoga is an excellent alternative therapy for Asthma, new research shows..
SALT LAKE CITY, UT -- October 27, 2006 -- Teamwork between a hospital asthma clinic and a legal assistance project resulted in asthma patients improving their health status by getting their homes' environments repaired. "Our asthma patients were amazingly compliant in taking their medication, but they weren't getting any better," said Mary O'Sullivan, MD, pulmonary specialist and chief, asthma clinic, St. Luke's-Roosevelt Hospital, New York, New York. "They were living in roach-infested, rodent -infested, moldy, dusty apartments." Attempts to get landlords to clean up the patients' homes had no results -- until the hospital partnered with a legal assistance firm, Dr. O'Sullivan said in a presentation on October 23rd at CHEST 2006, the 72nd annual meeting of the American College of Chest Physicians. Continue reading Home Repairs Helps Asthma Patients Reduce Steroids and Improve Disease Symptoms. RATIONALE: In an observational cohort study, women who self-selected for frequent aspirin use developed less newly diagnosed asthma than women who did not take aspirin. OBJECTIVE: To explore whether low-dose aspirin decreased the risk of newly diagnosed asthma in a randomized double-blind, placebo-controlled trial. METHODS: The Physicians' Health Study randomized 22,071 apparently healthy male physicians, age 40-84 years at baseline and tolerant of aspirin over an 18-week run-in period, to 325mg aspirin or placebo on alternate days. The aspirin component was terminated after 4.9 years due principally to the emergence of a statistically extreme 44% reduction in risk of first myocardial infarction among those randomly assigned to aspirin. Continue reading Aspirin and Decreased Adult-Onset Asthma. Continue reading The rise of an allergy nation. Continue reading Tanox initiates early stage trial of asthma treatment. Approximately 50 percent of infants and preschoolers receiving medical treatment for allergies display preliminary symptoms of asthma, making them at high risk of developing the respiratory condition later in life, according to the results of a survey released yesterday. The survey was conducted by Chang-Gung Memorial Children's Hospital on children up to five years of age who made recent outpatient visits to the hospital for allergies or asthma. The survey found 30 percent of these patients had persistent asthma, while another 50 percent had preliminary symptoms of the respiratory condition -- such as frequent coughing and wheezing. Continue reading Survey finds half of allergic toddlers have signs of asthma. It's rare that you hear of someone dying from food allergies, but when it happens, it usually reaches national news. Why? Because food is something we eat every day - several times a day - and everyone should be aware of the dangers of food allergies. Some foods such as peanuts contain very strong allergens that are in the food and released into the air as well. That's why someone with severe food allergies must be extremely careful where and how they dine out. There are approximately 150 deaths related to food allergies in the United States each year. Food allergies are responsible for more deaths than insect bites as well as reactions to medicines. Continue reading Food Allergy Awareness: Be Prepared With These Tips and a Medical Alert Wallet. Controversial medicine inhaler Salamol has been linked with deteriorating control of asthma in a study that has unleashed fresh criticism of Pharmac. Last year Pharmac planned to subsidise only one metered-dose salbutamol inhaler, Salamol, which would have forced more than 500,000 patients who used the Ventolin brand to switch or pay its full price. After more than 700 complaints that Salamol was ineffective, tasted bad or that its spray got blocked, Pharmac backed down and kept subsidies on both - temporarily. Continue reading Pharmac under fire again over asthma inhaler. If you are allergic to shellfish, you can end up in the hospital if you eat something with a protein found in shellfish. Any type of clam, including cherrystone, littleneck, pismo and quahog. Lobster, langouste or langoustine, scampi, coral or tomalley. Mussels, oyster, scallops or any kind of mollusk. Cockle, periwinkle or sea urchin. Continue reading UK: First Asthma Census Highlights Lack Of Control Of Condition. Continue reading Intervention Program Significantly Reduces Asthma-Related Emergency Department Visits. Altana's nasal steroid spray Omnaris has been approved in the US for allergic rhinitis. Altana's Omnaris, an intranasal corticosteroid based on ciclesonide, has been approved in the US for the treatment of seasonal and perennial allergic rhinitis in patients 12 years of age and older. However, given the major products already on the market and the recent patent expiry of Flonase, Omnaris is likely to have a limited impact on the field of allergic rhinitis treatment. 'Content Allergic rhinitis (AR) is a chronic inflammatory disease of the nasal mucosa causing sneezing, itching, nasal congestion, and discharge. Seasonal allergic rhinitis is better known as hay fever, while perennial allergic rhinitis is a chronic condition caused by triggers such as pet dander and dust. According to the American Academy of Allergy, Asthma, and Immunology, more than 40 million Americans are currently estimated to suffer with allergic diseases. Continue reading Altana: allergy drug faces obstacles despite approval. Continue reading Sesame Seed Allergy Alert. p-Phenylenediamine, the allergen of the year? Why now? Granted, p-phenylenediamine (PPD) has been the leading permanent hair coloring agent or oxidative hair dye in most of the Western world since its introduction in the 1880s, and it has been a problematic agent almost since its debut. Because of its allergic potential, it was banned in France and Germany from 1906 until the 1980s to 1990s, when it was again allowed for use in member states of the European Union. Continue reading Contact Allergen of the Year: p-Phenylenediamine. MILWAUKEE - When Colleen Pfaff was a toddler, her father forgot to wash his hands after handling blue cheese for a salad, and lifted Colleen into the tub to give her a bath. Hand-shaped welts immediately appeared on Colleen’s body. Her immune system had reacted to milk protein still on his hands. The welts subsided after washing with soap and water. But it was a painful lesson in how little it can take to trigger an allergic reaction to food. Continue reading Children most at risk for hidden food allergies. Continue reading Analysis: An asthma patient's best friend?. Asthma symptoms can be controlled by using heat to destroy smooth muscle tissue in the large airways, a researcher reported here. The experimental technique, dubbed bronchial thermoplasty, is also safe and well-tolerated, although the treatment caused transient worsening of asthma symptoms, according to Michel Laviolette, M.D., of Laval University in Québec City, Quebec. The technique uses a bronchoscopic catheter with an expandable, computer-controlled heating element on the end. The catheter is inserted into airways greater than three mm in diameter that branch off the mainstem bronchi, with the exception of the right middle lobe, Dr. Laviolette said at CHEST 2006, the meeting of the American College of Chest Physicians. Continue reading Destroying Airway Muscle With Heat Eases Asthma Symptoms. TUESDAY, Oct. 24 (HealthDay News) -- Devices called home nebulizers have been a boon to asthma care. But a new study shows that, if used improperly, they can also lead to serious asthma complications, even death. These machines turn medications into fine, inhaled droplets. But researchers at Michigan State University concluded that when home nebulizers aren't used according to the National Asthma Education and Prevention Program (NAEPP) guidelines, they may actually contribute to some people's deaths. "Widespread prescription and use of home nebulizers in asthma may have the unintended consequence of contributing to over-reliance on bronchodilators and inadequate use of inhaled steroids," the authors concluded. Continue reading Improper Home Nebulizer Use Boosts Asthma Risk. Interesting article in Australian press. Preliminary results show that if the animals had a 15-30 minute dose of light before being exposed to a common allergen their chance of developing symptoms was "significantly reduced". It has been already found that sun light is a vital contributor to healthy immune system. Time will show when light and therapy will get proper attention from scientists and consumers. Continue reading Sunlight may protect against asthma. Continue reading Food allergy and celiac guide to dining out. Continue reading Milk Allergy Alert, Products Recalled. LONDON (Reuters) - The General Medical Council (GMC) launched a national poster campaign on Monday to alert the public about new guidelines for doctors that encourage them to work more closely with patients. After a two-year consultation with doctors, patients and the public the medical watchdog has updated its "Good Medical Practice" guide on professional standards with a major focus on doctors' duty to work in partnership with patients. The GMC said this included their responsibility to advise patients about the link between health and lifestyle choices. Continue reading General Medical Council issues post-Shipman doctors' guidelines. Once again I came across the opinion that germs-free environment is actually bad for children. This topic was touched by the creators of website about vaccination hoax. You can read more here. "Early exposure is needed to stimulate the immune system"
"The best means of preventing an allergy is mother's milk"
Continue reading Exposure to germs can actually protect children from some allergies. Save $84.50 a year off our newsstand price: Subscribe today for only 38 cents a day! This has almost put me off a little, and I had to re-read the article. What's wrong with people who are actually writing something worth reading? Why there always has to be something distracting and repulsing? Anyways, I invite you to read the article about the herbal treatment which can help you to fight your allergy. 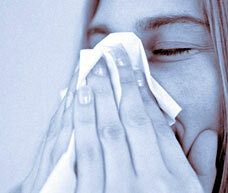 Continue reading Herbal remedies may give relief from allergies. Sun Pharma Advanced Research Company (Sparc), the recently demerged research entity of domestic pharma major Sun Pharmaceutical, is all set to take its lead molecule for anti-allergic treatment to the phase-II trials (trials on patient) in the US. The investigational new drug (IND) of Sparc has already received permission from the US Food and Drug Administration to enter the phase-II trials. The phase-II trials will be conducted in the US directly by the company, using a leading local CRO (clinical research organisation). This will mark the first IND filing and phase-II studies in the US by an Indian company working independently, that’s without a partner. Continue reading Sun allergy drug set for phase II US trials. LIFE saving allergy training would be mandatory for teachers and childcare workers if Labor wins next month's Victorian election. Premier Steve Bracks today announced the Government would spend $2.1 million over five years to train childcare workers and teachers how to treat children with life-threatening anaphylaxis - a severe allergic reaction. The package would include training to reduce the risk of exposure to anaphylactic triggers - such as peanuts and shellfish - and how to administer a life-saving shot of adrenaline through an Epi-pen. Continue reading Labor backs allergy training plan. Mast cells are specialized cells that react to allergy-causing agents by releasing substances that trigger the body's allergic response, leading to conditions like asthma and hives. Among the molecules released by mast cells that participate in the allergic response is sphingosine-1-phosphate. This molecule is also implicated in cancer. Continue reading Potential New Therapeutic Target For Asthma, Allergies And Cancer. It's no surprise a severe asthma attack can force someone to go to the hospital. It might surprise some to learn chemicals and substances commonly found inside hospitals can cause asthma or trigger asthma attacks. Cleaning products, latex gloves, pesticides, dust, mold and even some medications can cause or exacerbate asthma, according to a report issued Wednesday by Health Care Without Harm, an international coalition of 450 groups trying to make the health care industry safer. "Ironically, many products that are used in hospitals to keep patients, visitors and personnel safe from pathogens represent some of the very same products that have some potential to cause or exacerbate asthma in susceptible individuals," the report states. Continue reading Hospitals clean out allergy, asthma triggers. SATURDAY, Oct. 21 (HealthDay News) -- Raking and burning autumn leaves is a rite of the season for many, but those with allergies may want to avoid it, experts say. Continue reading Falling Leaves Mean Rising Allergies. NEW YORK (Reuters Health) - Depressive symptoms are common among inner-city adults hospitalized for asthma flare-ups, according to a new study in the medical journal Chest. Furthermore, such symptoms identify individuals who are unlikely to stick to their asthma medication regimen when they go home. "Typically, when someone comes into the hospital and we treat their asthma, we don't necessarily look at whether they are depressed," Dr. Susan J. Bartlett commented. "But maybe we need to, because these individuals are really at very high risk of being poorly adherent to their asthma therapy once they get out of the hospital." Continue reading Depression tied to poor asthma therapy adherence. Continue reading New treatment may mean no meds for some asthma patients. Continue reading State office workers to be moved soon. SYDNEY, Oct. 20 (UPI) -- Australian researchers find that although soy infant formulas are used to avoid food allergies, there is no proof that soy formulas cut allergy risk. "There is no evidence that using any type of formula is better than exclusive breastfeeding for prevention of allergy," said study authors Dr. David Osborn of Royal Prince Alfred Hospital and Dr. John Sinn of Westmead Hospital. "Specialized formulas should be restricted to situations where infants cannot exclusively breastfeed or when an infant develops a specific food allergy or hypersensitivity." Continue reading No evidence soy formulas cut allergy risk. I find this article very inspiring. And not only for those who have asthma. Jackie Delamater can be a role model for every person who is sick. When Delamater crossed the line at the Strongsville Invitational in 19:58.85, it meant more than just a new personal record. It meant beating asthma after a four-year struggle. It meant casting aside a month of doubt and worry caused by health problems. It meant overcoming childhood anxieties. I invite you to read this long but very interesting story. Continue reading Despite health, Hoover senior keeps running. Continue reading Broadsystem Supports Asthma UK For Second DRTV Attack Card Awarenes Drive. Continue reading Asthma cases on the rise. Continue reading "Asthma All Stars" Asthma Fair Kicks off at Kohl's. Continue reading Hospital Chemicals Can Trigger Asthma. Continue reading Earlier Solid Foods for Children - Safe or Not?. Continue reading Lung Function at Birth May Predict Asthma Risk. What is causing the allergy? Different allergies have different triggers. Recently scientists from Virginia Commonwealth University have found a possible cause. Continue reading Transport mechanism of bioactive molecule, S1P, identified. Continue reading Hood Orders Recall Of Some Apple Juice Products. Continue reading Allergy study skips shots and goes for the tongue. LONDON, Oct 17 (Reuters) - People who suffer from coeliac disease have an increased risk of developing tuberculosis, according to research published on Tuesday. Coeliac disease (CD) is an illness caused by an intolerance to a protein found in wheat, rye and barley. Swedish scientists who studied hospital discharge records from 1964 to 2003 found that patients diagnosed with coeliac disease were more likely to suffer from tuberculosis (TB). Continue reading Coeliac sufferers have greater TB risk. Drinking the probiotic, fermented milk, kefir, decreased the allergic response to ovalbumin (egg white) in mice, and may offer hope to preventing food allergies, suggests a new study from Taiwan. "Consumption of milk kefir and soymilk kefir suppressed [immune] response and altered the intestinal microflora in our supplemented group," wrote lead author Je-Ruei Liu from the National Taiwan University. "Milk kefir and soymilk kefir may be considered among the more promising food components in terms of preventing food allergy and enhancement of mucosal resistance to gastrointestinal pathogen infection." Continue reading Kefir ingredients could help food allergies. "My brother is allergic to raw carrots but has no reaction to cooked ones. How is this possible?" - asks Tony from new York, NY. Continue reading "My brother is allergic to raw carrots but has no reaction to cooked ones. How is this possible?". Tawnya Shipley has a good reason to spread the word about asthma. Her 8-year-old son, Trystan Herzog, narrowly escaped brain damage five years ago when he had his first attack of what became chronic asthma. The family was living on an Air Force base in Japan at the time. On a trip to the grocery store, a friend who was helping Shipley buckle her son into his car seat noticed that the 3-year-old's breathing had become shallow, and he looked pale and tired. Continue reading Taking a walk could benefit asthma research, programs. In the whirlwind of activities that makes up the life of a 4-year-old boy, something flashes on Luke Babin's arm. A medical alert bracelet proclaims that he's a little different from other boys who play soccer and watch Curious George. "I'm allergic to dairy," Luke explains. Luke is one of about 12 million Americans who suffer from some food allergy, and the numbers are growing. Continue reading Children's food allergies leave parents with no room for error. ISLAMABAD: Unpredictable weather changes, respiratory viral infections, and unprecedented heat and humidity in August and September increased the misery of respiratory allergy and asthma patients throughout Punjab and parts of NWFP. The management of their illness becomes a challenge in Ramazan for many allergy and asthma patients as the holy month is associated with a significant change in daily routine patterns. Many believers visit mosques more frequently during Ramazan than any other time of the year. They expose themselves to dust from carpets, and many experience difficulty in breathing during 'sajda' (kneeling). Continue reading Preventing aggravation of allergy-like symptoms during Ramazan. Continue reading General Mills Issues Milk Allergy Alert on some 13-Ounce Boxes of Golden Grahams Cereal. A daily tablet that could cure hay fever will be available within months. The pills, which dissolve under the tongue, dramatically reduce the symptoms of the allergy which blights the lives of one in four Britons each summer. Manufacturer, Danish drug firm ALK-Abello, believes its Grazax tablets, which can be taken at home, will even cure some sufferers. The prescription-only pills, which are based on grass pollen, have recently been licensed for use and are expected to be on sale in the UK within three months. Popped under the tongue once a day during the summer, they are the first tablets to tackle the underlying course of hay fever, rather than merely treat the symptoms. Continue reading Tablet that could cure hay fever. Overactivation of two receptors for histamine, normally associated with common allergies and acid reflux, may explain why some people, including highly trained athletes, pass out soon after heightened physical activities, according to researchers at the University of Oregon. A series of studies led researchers in incremental steps to the discovery that the use of two commonly used antihistamines (fexofenadine and ranitidine) prior to exercise dramatically lower or completely eliminate low blood pressure following exertion. The drugs worked by preventing post-exercise hyperemia, an increased flow of blood, in the skeletal muscle during the critical 90-minute recovery period after exercise. In all, the pre-exercise consumption of the two antihistamines reduced the blood flow that occurs during recovery by 80 percent. Continue reading Histamine Tied To Changes In Blood Pressure During Exercise-recovery Period. High-efficiency air filtration equipment 100 times more efficient than standard paper filters can be added to existing central air conditioning and heating systems to remove 99.98 percent of airborne allergens. Southlake, TX (PRWEB) October 13, 2006 -- Autumn brings crisp days and cool evenings to North Texas, a welcome change from the grueling heat of a sizzling summer. It also brings a few things not so welcome – runny noses, watery eyes, itchy throats, sneezing and congestion that are classic symptoms of seasonal allergies. The Asthma and Allergy Foundation of America (AAFA) again has named the Dallas/Fort Worth area one of the 10 worst places in the United States for fall allergies, which dulls the fall luster for many North Texas residents. Continue reading New Air Filtration Technology Brings Relief to Allergy Sufferers. Continue reading Seasonal Allergy Alert. Continue reading High in-hospital death rate with asthma flare. Continue reading Children of allergy sufferers prone to same problem. Lamb and pears may appear to be a strange combination, but the reason they are chosen as part of a food allergy diet is because they are rarely indicated in allergies and are therefore relatively safe foods for most people with a food allergy to eat. Often the best way to treat a food allergy is to avoid the food that causes the allergy altogether so a period of exclusion gives your body a chance to tell you which foods are making you ill and whether you react to one food or many foods. Continue reading How Lamb and Pears Can Help Your Food Allergy. Continue reading The gluten-free life. Patients with symptomatic moderate asthma who were treated with anti-tumor necrosis factor alpha, an anti-inflammatory monoclonal antibody, experienced significantly fewer disease exacerbations than individuals taking a placebo. This research appears in the first issue for October 2006 of the American Journal of Respiratory and Critical Care Medicine, published by the American Thoracic Society. Continue reading Monoclonal Antibody Reduces Exacerbations In Asthmatics, Study Finds. European public health experts are concerned because “allergic diseases” in all their different aspects - from hay fever to fatal attacks of asthma or reactions to peanuts - are not included in the health priorities of the EU research programme. While allergies are mentioned among the food research priorities, the absence of wider allergy problem as a top concern in health research agenda threatens to comprise overall progress in the understanding of this complex condition. Continue reading EU Health Research Must Prioritise Allergies. Americans accustomed to the seasonal misery of sneezing, runny noses and itchy, watery eyes caused by ragweed pollen might one day benefit from an experimental allergy treatment that not only requires fewer injections than standard immunotherapy, but leads to a marked reduction in symptoms that persists for at least a year after therapy has stopped, according to a new study in the October 5 issue of i The New England Journal of Medicine (NEJM). The research was sponsored by the Immune Tolerance Network, which is funded by the National Institute of Allergy and Infectious Diseases (NIAID) and the National Institute of Diabetes and Digestive and Kidney Diseases (NIDDK), both components of the National Institutes of Health (NIH), and the Juvenile Diabetes Research Foundation International. Continue reading Allergy Sufferers Offered Longer Relief With Fewer Shots Using Experimental Ragweed Therapy. Continue reading Positive Results From Dynavax' Ragweed Allergy Therapy Trial. Continue reading GMOs And Allergies: Tests May Help Answer Questions. This page is a archive of recent entries written by ID Admin in October 2006. ID Admin: September 2006 is the previous archive. ID Admin: November 2006 is the next archive.